A map of the ten sites that Emanuel and Rauner have identified as potential locations for Amazon's second headquarters. Provided by City of Chicago. Amazon announced in September that it’s looking to open a second headquarters in the United States, and it wants cities to apply to be the host. Chicago was one of 238 cities to submit a proposal, outlining direct and indirect incentives, including tax breaks and a commitment to infrastructure spending, as well as listing ready-to-develop sites. Amazon projects that “HQ2” will have up to 50,000 workers over 15 years, and they say it will require eight million square feet of office space. the online retail giant wants to be close to transit, research universities, highways, and an international airport. Here’s a looks at the pros and cons of each of the ten potential HQ2 sites that Governor Bruce Rauner and Mayor Rahm Emanuel identified in the application they co-submitted last week, from a transportation perspective. There are eight sites in Chicago and one each in Schaumburg and Oak Brook with highly varying degrees of walkability and access to transit and bike routes. I also rated some of the sites for their potential to accommodate new homes for higher-paid workers in a way that would minimize the displacement of lower-income residents due to rising housing costs. Pros: Extremely well connected via bus and rail transit (both CTA and Metra). Driving here is also convenient because there is a lot of parking available and it’s near the extremely congested Kennedy and Dan Ryan Expressways (which could stand to be tolled to raise revenue for maintenance, better transit, and to reduce congestion, which causes additional pollution). There are many underdeveloped properties (namely surface parking lots) that could serve as new housing for the new workers; having the new housing here would reduce the potential for displacement that might result from workers moving into gentrifying neighborhoods. Bike network connectivity is relatively good, since almost half of the streets that border the three named buildings have bike lanes, and most of the lanes are protected. Cons: While there are Loop Link bus-only lanes on Canal and Clinton by Union station, east-west bus traffic by these three buildings is slow because of the lack of dedicated bus infrastructure. But bus and bike access can be easily upgraded without much additional investment. The Thompson Center and surrounding buildings (although there is only one vacant site, on the west side of Franklin between Washington and Randolph). Pros: Extremely well connected via bus and rail transit (both CTA and Metra). Plenty of car parking is available and the site is near the Kennedy Expressway. Bike access is decent, with protected lanes on Randolph and Washington, and buffered lanes on Franklin. Cons: There is little room to add immediately adjacent housing, pushing workers to neighborhoods outside of downtown, where they may accelerate displacement. There is still room, however, for tech-worker-level housing in the other named sites (Fulton Market, Lincoln Yards, River District). Goose Island area (former Finkl Steel site and Sims recycling site). Pros: The Kennedy Expressway and the Clybourn Metra station are nearby, and the Armitage Brown Line stop is about a 15-minute walk from the center of the site. Bike access is good, with nearby lanes on Elston, Cortland, Clybourn, and Armitage. The eastern end of the Bloomingdale Trail, aka The 606, is a few blocks west, and there’s talk of extending the trail east across the Kennedy to reach the site. The area was just rezoned from purely industrial to zones that allow mixed-use commercial and residential, opening up the area to build new housing to mitigate gentrification and displacement in surrounding neighborhoods. Cons: The pedestrian connection to Metra is dark and dismal, and the infrastructure is dilapidated; service is also infrequent. Metra is only convenient for people who live downtown or in neighborhoods or suburbs along the UP-N and UP-NW lines. The existing service probably doesn’t have the capacity to accommodate all of the new workers who would take transit and there isn’t any funding to increase frequency or capacity on these lines. East-west bike access, especially to the Bloomingdale, has room for improvement. Chicago Tribune Freedom Center (printing plant) and former distribution center on the Chicago River near Chicago Avenue and Halsted. Pros: Close to the Kennedy Expressway. The Chicago Avenue bus route runs frequently and 24/7, but is overcrowded. New funding would be needed to increase frequency, and adding bus lanes would increase travel speeds and help prevent bus bunching. There is sufficient space to build thousands of new dwelling units on the site, which could help minimize displacement of existing residents in other neighborhoods. The site is convenient to River North, River West, and West Loop entertainment areas. Cons: The site can be reached by foot from several ‘L’ stations and the West Loop Metra stations, but most of them are at least ten minutes away by foot. Bike access is mediocre, with Halsted being the only nearby bike lane street. This city-owned land, the site of the former Michael Reese hospital, was going to be the site of the Olympic Village if Chicago had won the 2016 games. The city borrowed money to purchase the site and recently inked a deal with a joint venture to develop the land. Pros: Close to Lake Shore Drive and the Dan Ryan Expressway. The Metra Electric District 27th Street station is nearby. Biking to the site is easy via the Lakefront Trail, and 31st Street has a protected bike lane that goes east-west from the Lakefront Trail to Bridgeport, although segments of the route lack protection. Cons: Service to the 27th Street station is infrequent, but that could change if the site was developed and Metra received additional funding. The nearby King Drive bike lanes aren’t a particularly comfortable place to ride due to multiple travel lanes and no physical protection. Various office buildings, many of which are under construction; there are many developable sites currently owned by different property owners, but several of them are occupied by vintage buildings, some of which may be protected in the Fulton Market Innovation landmark district. Pros: The Green and Pink lines offer connections to housing on the Lower West Side and West Side, as well as in the Loop. The Halsted and Madison bus routes are frequent. The Madison route takes people to and from the Metra stations in West Loop Gate across the highway, and the Halsted bus takes people to and from the UIC/Halsted station. There is or will be plenty of office space to absorb thousands of new workers. Close to the Kennedy Expressway and Eisenhower Expressway. Cons: The Halsted and Madison bus routes are slow and Halsted doesn’t run 24 hours. Halsted lacks bike lanes in the West Loop and has a tight layout with lots of car traffic, so parallel side streets, like Green, Morgan, Racine, and Loomis, are preferable. Most of the housing that is currently accessible from the Green and Pink is unlikely to attract many high-paid Amazon employees would end up living, but workers who move to neighborhoods like Pilsen, Little Village, the Near West Side, and East Garfield Park would contribute to displacement in these communities. The addition of 50,000 new workers will likely exacerbate the amount of ride-hail and taxi traffic in the area, which is already extremely high because of the neighborhood’s “destination” status (many people to the West Loop day and night for work and entertainment but live elsewhere). Land for new, affordable housing is rapidly disappearing. Many developable (vacant) sites; however, the City of Chicago has very little control over the area because it is controlled by a state authority. Pros: Close to the Eisenhower Expressway. The area is very well-connected by CTA bus and ‘L’ several and has several bike routes between it and neighborhoods. The Blue Line operates 24 hours, and the Pink Line is a quick way to get to attractions and housing at Morgan and downtown. There are so many developable sites that the IMD could be expanded with thousands of more dwelling units. This an ideal place to add this amount of housing without having to demolish existing buildings (as in Fulton Market) or accelerating displacement and gentrification. Cons: Similar issue with connection to worker housing as Fulton Market. While Ogden is the most direct bike route downtown, most of the route lacks proper bike lanes. So called because it would be “the 78th neighborhood” in Chicago (when you factor in The 606 and the upcoming 312 RiverRun trail network, it sure seems like this administration likes naming things after numbers), this large site is located close to the Loop and is owned by a single entity. It has some site access problems for which the City of Chicago has proposed solutions, but owner Related Midwest has been mum on specifics. Pros: The multi-line Roosevelt ‘L’ station is very close, and many buses stop nearby. Once the street network is built out inside the property, it’s possible that the CTA will reroute a bus route, such as the #18 16th-18th, so serve this location. It’s close to Lake Shore Drive and the Stevenson Expressway. Cons: It’s hard to gauge transportation access here because there’s a currently literal and figurative wall around the property (including Metra tracks that have no crossing) and no internal street network. Until the street grid is built, it’s nearly impossible to analyze the walkability and bike-friendliness of the property. On the plus side, this blank slate gives us an opportunity to design and build a standout street system. Roosevelt Road, on the north side of the property has bike lanes, but the multilane street is a stressful place to ride. Pros: The nearby Ned Brown Forest Preserve is a nice place to ride a bike, but that’s probably not part of Amazon’s consideration. There are a couple of side paths for biking along the wide arterials near the site, one of which crosses over the tollway to the wider Schaumburg side path network. Cons: Despite the many Pace bus routes that stop at the Northwest Transportation Center across from Woodfield Mall, neither the Woodfield Mall area or the site are walkable area or bikeable areas, at all. The new walkable, urban neighborhood idea is not a bad one, but building one in the middle of car-centric suburbia is easier said than done. It’s likely most workers would live and play elsewhere in the suburbs. The best neighborhoods are made by many different people, businesses, and organizations over time – not based on a master plan. The proposal is to have Amazon take over the former McDonald’s headquarters, aka Hamburger University, which is not far from the Oakbrook Center mall and many office buildings along I-88. It has a tranquil setting in a private forest. Pros: [Crickets.] Well, it’s very “driver-friendly” because of the close proximity to I-88, I-290, and I-294. Cons: Transit access is extremely poor, consisting of infrequent Pace bus routes. It takes two hours and multiple transfers to get there by transit from downtown Chicago. 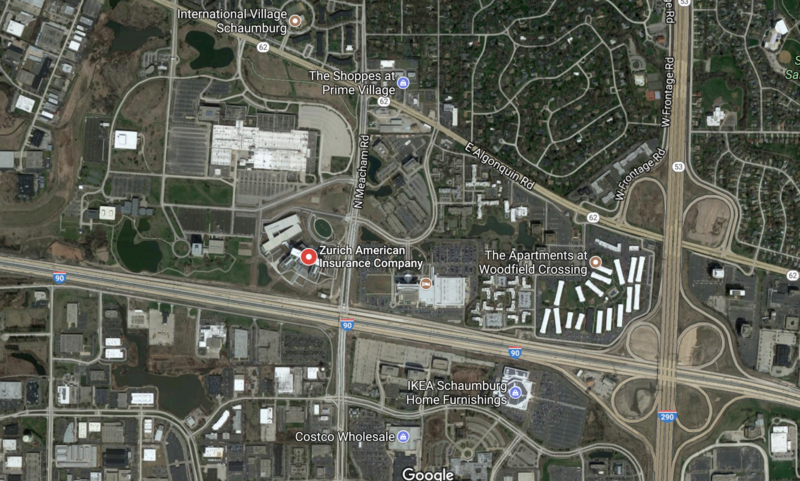 However, like the Schaumburg site, there are a lot of space and opportunities to build dense, walkable housing. And none of them include any proposals south of 31st. They can’t possibly be serious about this. Which sites or areas south of 31st do you think meet Amazon’s requirements? Please don’t feed the “78th Community Area” beast. That plot of 62 acres translates to 0.1 square miles. The Near South Side (community area 33) is 1.75 square miles. This is just a lame branding gimmick. I dunno, it seems like a smart marketing ploy. It’s physically disconnected from surrounding areas and better infrastructure is unlikely to make it feel less isolated. Giving the area its own character makes it a destination in its own right, apart from South Loop or Chinatown. That being said, the map of community areas has little connection to either the psychological boundaries of neighborhoods, as perceived by residents, or the ward map. Plenty of room at the Southworks site, but I don’t see that happening. There’s also no proposals north of Armitage….or west of Damen for that matter. Also, they friggin’ disappear exactly where you need them most: underneath the Stevenson and through McCormick Place. On the other hand, it might require no less than a hoard of rich, well-connected, Amazon-employed bike commuters traversing between Bronzeville and more trendy neighborhoods on the north side to get that to change. Southworks. Finkl. Has Hawthorne been claimed yet? The McDonald’s Oak Brook campus has no Pace (or other transit) service at all. Pace service on 22nd is a full mile away. As for Riverside Park (Clark & Roosevelt), the most sensible way to get transit is simply to extend the 22 or 36 buses, and reroute the 24 via the new Wentworth. With a truckload of money, it would also be pretty simple to put a Red Line station at 15th & Clark. I think that Red Line station would be too close to Roosevelt. How would workers get to Southworks? The map of community areas, however, does have a role in measuring city policies as the community area is used in plans and studies. They’re also fixed, well-known/described and “agreed upon” boundaries (even if you don’t agree why or how they were created, you can believe that the creators in the 1910s drew the boundaries in a certain way for the reason of comparing variations in health outcomes). It would be a half-mile from Roosevelt, same as Harrison. My fear is that Related will instead propose some TIF-funded gadgetbahn that just links their site to Union Station and the Blue Line. I prefer a rubber tired diesel powered bus that looks like a fictionalized version of a streetcar.